How many of you are already rich and made enough money for your lifetime?? :-) If you already are in this category, the chance of you continuing to read this article will be extremely minimal. How many of you want to become rich and are on the path? I am sure almost all of you will want to retire early and do the things which really mean something in your life. Many people struggle day and night at work, losing a lot of family time and aspiring that one day, they would be relaxing in some nice place without any tension or stress. In the stock market, most of the people get in to make some extra money. They put money in a listed company hoping that it would grow really fast. But, does it really work? Ask yourself this question. Have you really created wealth in the Stock Market? I get tons of emails everyday from traders & investors around the world asking me to review their portfolios and asking me where they went wrong. Many times, I see that they have chosen good, quality companies. But they would have slightly got their timing wrong. The stock they have chosen would be around 20% below their buying price (I am sure we have all experienced this). But, as we all know, no one can time the market. Also, they do not give enough time for their investments to start churning out wealth. Friends, the Stock Market is a Wealth Creating Machine. Considering the inflation, this is one of the best forms of investment. But the matter of the fact is that most of the people gamble their money away in the same market, where a few people create massive wealth? What is the secret? How do some people really create wealth? Pause and click to read some interesting articles before proceeding further. How did Warren Buffet become rich? We all work for money. Have we ever tried making money work for us? Most of us would have heard about SIP. Please remember that SIP is not a product or a company :-) It's a discipline. It's a mindset. It's an approach to investing. It's a long term vision with patience. 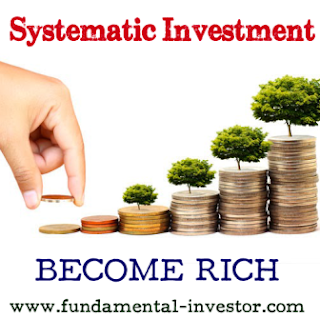 SIP is a Systematic Investment Plan. A SIP is a strategy where we allocate a fixed sum of money to be invested in an instrument at a regular interval of time (mostly monthly). We have various instruments to invest in, like Recurring Bank Deposits, Mutual Funds, Equity etc. Most of us would have invested our money in a Recurring Deposit or Provident Fund. In this case, the rate of interest will be stated clearly before we begin the investment and we are assured of that interest. Whether, the interest given can beat inflation or not, is a big question. The purchasing power of money declines over time. Fifty years back, the value of Rs 100 was much more than what it is today. In the next 20 years, the value of Rs 100 will diminish much more. In this case, a SIP in Mutual Funds or Equity might seem a better choice. Let's look at it from different angles. 1) It creates a habit of saving and investing regularly. When we get our salary every month, we generally spend first and invest the remaining (if it remains). This approach will never give us returns in the long term. We need to inculcate this habit of intelligently parking a certain amount regularly into a money creating machine. 2) Many times, we would not have a lump sum in hand. In this case, investing a small amount of money every month would not be very difficult. SIP is the best for that. 3) Never invest the money which you need immediately. A SIP is designed for investors to park their extra money without touching it for longer period of time. 4) The law of averaging helps investors in SIP. When we buy shares of a company every month, we will get advantage of both rise and fall of shares. If the company is going to do well in the longer horizon, we will get the full benefit of it. 5) If the company's revenues grows at a significant rate (more than 10-12% every year), we will start compounding our money. Ill write another articles on Power of Compounding sometime. 1) If we go for a SIP in a low quality fund or stock, we are bound to be in trouble. We need to choose high quality stocks. 2) Even if we manage to choose a high quality stock, we need to track it well in the course of the SIP. If there is some negative news on the credibility of the company, this will become a disaster. 3) Since we invest the amount in a share regularly on a particular date of the month, we might not get it in the best price of the month. 4) A SIP will work for investors with a long term horizon. I am putting this in this section since SIPs can create enormous wealth in 5 - 10 years of time. You might not get immediate returns. Please watch this video which was made in 1957. The relevance and the explanation is valid to this date. This video touches upon the basics in a very simple way and easy to relate to. As we all know it, the intelligent time spent in the market is far more important than trying to time the market. Nice blog,Thanks admin for sharing this information.Fixed Deposit is help us to save lump some of money for fixed period of time. Happy that you found this site and article helpful madam. Hope you will reach this to many more. Thanks.. There are good companies which will Compound money will in next 3-5 years time. Also, some good Mutual Funds for compounding. Read my latest article for some good compounders which have worked for me and should work for a few more years comfortably. Hello FI, Couldnt find your article on Good compounders, can you please share the link. As of now the only company I know which falls in this category is PEL. Is there any other on which we can discuss? Thankyou. In this link my experiences are given. As always very informative post. I liked the fifth point - 'Have the right friends'. I must say Amit's and your posts have helped me change my course of investment. I have moved all my investment in companies with strong fundamentals. Just got saved by the midcap fall. Thanks a lot.